Just over a year ago, Mark Lawrence launched his Self Published Fantasy Blog Off in which over 250 self-published novels were submitted in batches to ten volunteer bloggers in a two round competition. Each blogger identified the favourite in their personal batch and then the ten batch winners were reviewed by all bloggers to identify an overall winner. 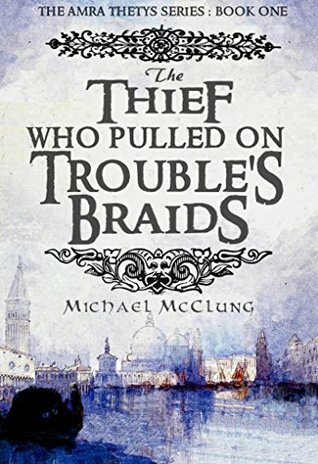 Yesterday, on an impulse, I bought the overall winner "The Thief Who Pulled on Trouble's Braids" by Michael McClung. Today I finished it and then discovered that Mark Lawrence had just announced the SPFBO #2 (posted here) and that makes this not simply a review of this very worthy winner of SPFBO #1 but also an opportunity to reflect on self-publishing in general and the SPFBO process in particular. As a self-published author myself (and SPFBO #1 first round entrant) I have a natural sympathy towards self-published work and McClung himself wrote eloquently in Lawrence's blog (here) about his own motives for self-publishing. It was more to do with impatience and disappointment with the traditionally published route, than the blinkered narcissism that most of those who still look down on self-publising would assume. I have read many self-published books, including three of the eight I have read so far in this (irritatingly busy) year. There is a range in their quality just as there is in the quality of traditionally published books but, unsurprisingly, the range in self-published work is greater with authorial enthusiasm carrying some weaker works half-formed into the public domain. However, there is a significant region of overlap where the best of the self-published works can put many a traditional piece to shame. The SPFBO had a degree of randomness in the approaches of bloggers and the allocation of titles, but it is reassuring to find that the book which eventually emerged victorious is a shining star in the self-published pantheon. This is a well crafted book about a thief called Amra setting out to avenge a friend. Its central mystery carries it through a series of intruiging plot developments and engaging new characters, while the high quality of the writing gives the reader many points at which to pause and smile in appreciation. It reminds me of Daniel Polansky's Low Town series which had the cynical first person narrator "The Warden." Amra, like the Warden, has carved out a successful career on the wrong side of the law yet preserves an inner morality that she would die rather than admit to. There are touches of Scott Lynch's work "The Lies of locke Lamora" in a well developed sense of city and culture and a multiplicity of Gods, priests and temples none of them to be entirely trusted. There is also a resonance with Lucas Thorn's (another self published novelist) work, the tales of the violent elf Nysta. Like Nysta, Amra has a wide variety of bladed implements whose individual properties she is intimately aware of and very efficient at using. Like Nysta, Amra also has a friend of the wizarding persuasion. And, yet again I find myself enthralled by (or in thrall to) a feisty female who takes crap from absolutely no-one. The world building is cleverly incidental. Asides that tell us Atan the Camlachan purveyor of cooked meat is from a fallen warrior race and "should have been handling a broadsword, not meat skewers." Like all good cities Lucernis has its own version of the Shanghai Hilton, though I did wonder if Havelock prison was a homage to Pratchett's Patrician Vetinari. The city is, if not quite a den of vice and iniquity, certainly no better than it should be. "You can't just go walking around with a severed head in Lucernis. But you can, I discovered, walk around with a lumpy head-shaped item, wrapped in linen and dripping blood. I think it's just that nobody really wants to know you're walking around with a severed head, and are appreciative of the courtesy of leaving room for doubt." McClung gives his heroine a sharp and distinctive voice, in describing her friend and ally she muses "Why he chose to live next to a field of bodies in various states of rot I'll never understand. But I never asked him. I was afraid he might tell me." The book is littered with economical but powerful descriptions which I always think are the mark of a great writer - making every word punch above its weight. Such as one grieving woman, "She sat rigid as ever, but one manicured hand was white-knuckled, throtting a silk napkin." Or an old man whose "wrinkles had wrinkles and his hair was little more than a silver net across his spotted pate." Amra is an entertaining and educational narrator, a skilled thief who speaks to the camera every so often, such as explaining why she wraps her grapnels in white cotton. She meets and describes a variety of people and, while she is unlucky in her enemies, she can count herself fortunate in her friends who are loyal and/or powerful, though for Amra the relationship is often seen in simple terms "We put meat on each other's tables." This is a short book in an age when fantasy fiction seems to require door stopping blockbusters filled with backstory. McClung handles exposition by putting some of it in the mouth of a cussed priest of a dead god of knowledge. In most unpriestly but entertaining language he berates our heroine and fills her in - somewhat belatedly - on what she is up against. Then, just for badness, there is an epilogue of said priest's rantings - far more enteraining than a dry appendix of info-dump. The story develops rapidly with the twists and turns enough to satisfy an afficianado of both fantasy and murder mysteries (which may explain its dual appeal to me.) In so doing McClung lays the seeds (if I have read my runes correctly) for seven more sequels in Amra's troubled life. In book one we have got to know her and her most significant allies. If there is character development (as opposed to revelation) then I guess it lies in Amra discovering not so much that "the only thing to fear is fear itself" (there are plenty of really scary things well worth fearing in Amra's world) as that "the only thing to hate is hate itself." Which, by the way is not a bad message in the troubled contemporary times in which we live. What other Self published works might learn from McClung's success ? The Thief who Pulled on Troubled Braids, more so than other self-published works I have read, is one that could easily take its place within the higher echelons of traditionally published fantasy. I read H.G.Wells "The Time Machine" recently and was interested to discover that it was Wells' early big idea, rushed out without the time he felt it deserved for the fuller development. For many self-published authors there is that same enthusiasm for a single big idea, a theme, or style, or perspective that makes their story unique. But, the big idea is not enough, the craft and the mastery of basics are essential and that is what McClung has achieved. In my youth I used to play cricket at a fairly low grade level. I bowled and I, and other bowlers I played with would strive for that same unique specialness in our bowling that so many authors aspire to in their writing. We dreamed of that special delivery, the unplayable ball, the one that was as fast as a rocket, that spun like a top, that did stuff no batsman could predict. But the truly successful sportsman, like the truly successful writer, is not the one with the isolated flashes of innovative brilliance. It is the one with the control of craft to deliver consistently high quality performance. It is within such a disciplined environment that brilliance can be most properly and effectvely expressed. McClung maintains that quality and control - getting the basics consistently right, and it is that foundation which, for me deservedly lifts a good story into the truly professional bracket. What impact has the SPFBO victory had for McClung? and that b) is something every author needs to work on - and fans need to support. McClung's book is a really good book - it deserves a wider audience than it seems to have got so far. Maybe SPFBO as a competition needs to find ways to spreading its own message more widely, so that this great winner shall succeed beyond the competition, with countless readers clamouring for copies! Great article, great winner and great competition. And now, SPFBO 2 is up and running! Thanks so very much for taking the time both to read Amra's (mis)adventure, and for doing such a comprehensive write-up. I'm very pleased you enjoyed it! I think the SPFBO, if it continues on from year to year, will gain a level of gravitas that will help winners and finalists find a higher footing, commercially. Many readers didn't even hear about it until it was over, judging by r/fantasy comments. I think it likely SPFBO2 will have many more interested observers as it unfolds, and that can't help but translate into greater commercial success. As for the Amra series, a couple of things -- it'll be at least ten books, as I seem to have a very hard time turning down side-quests, as it were. I'm working on the fifth book now. And while I obviously think the series should be read by all and sundry, I do have to acknowledge that it isn't quite mainstream fantasy. "Sword & Sorcery Noir" is never going to be a best seller (happy to be proven wrong, of course). If a fantasy writer really wants to build a *huge* base, then they need to write what is popular with the broadest spectrum of fantasy readers. That would multi-volume door-stopper epic fantasy, of course. George R.R. Martin, Brandon Sanderson, Robert Jordan, Steven Erikson; these guys write big, big multiple point-of-view books in series. The only part I got right was the 'in series' bit. Anyway, listen to me babble. Thanks once again! I'm glad you liked the review, Amra's story really did exceed my expectations of it. It's hard to work out if there ia formula for success - but not everybody wants a blockbuster, or a proliferation of PoVs or epic grandeur (though I can see that peeking out from beneath Trouble's braids, for some a compact well told story is perfect! For teh rest - well they just need educating.